Gina challenged the CenterStage Spotlight team to make a card with the new Hope is Faith stamp set using the photo above for inspiration. Check out Gina's blog for all the details on this special stamp set. What a beautiful picture Gina has challenged us with. I just LOVE this Hope is Faith stamp set! The Butterfly is Gorgous!! I went with a more CAS card to let the butterfly shine. I stamped the butterfly twice and cut one out and attached it in the center. It looks like it's flying off the card. I colored the butterfly with copics and sponged softly around it. Thanks for stopping by! Oooh this is so pretty! I love the sponged background. oh wow! I just left Sue's blog and thought her b-fly matched the photo so perfectly, but I think you have it nailed EXACTLY!! love your card! Beautiful - love that embossed flower that's softly sponged. Gorgeous. What pretty sponging on your background and the gingham bow is icing on a beautiful card! Gorgeous! Love the embossing on this! Beautiful Janice!! Your colouring on the butterfly is perfect, and the soft background is so pretty!! Ohhh, love the background you created for your adorable butterfly...such a beautiful card! Hope you have a wonderful weekend! Hi Janice! I love your choice of embossing folder for this card - it's perfect! Your coloring is gorgeous and I like your little triple-loop bow! This is just beautiful Janice! Janice-Lovely card- awesome coloring on the monarch!!! Love the way you sponged, Janice! I really thought it was soft chalking. Just lovely! Beautiful card, Janice! 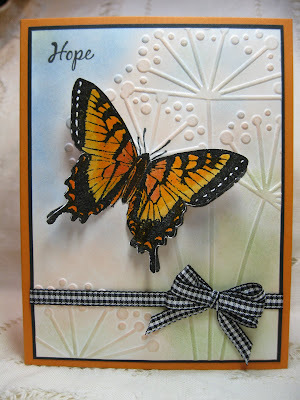 I love the embossed background and the gorgeous butterfly! This is gorgeous Janis! Love the embossing and your butterfly looks alive... I think I saw a wing move! SO pretty. Your coloring is gorgeous. Love the butterfly on the embossing folder. VERY VERY nice! That cuttlebug folder is perfect!!! Such a pretty card Janice. I love the embossing folder you used, it was perfect for the butterfly. Really pretty card, Janice. I too love that embossing folder. The butterfly just looks perfectly in place there. This is stunning! Love that embossed background. Beautiful card! Love it how the butterfly combines with the embossing! Janice, I love your background and the butterfly is gorgeous! Awesome card Janice! Your butterfly is beautiful and your embossed/sponged background is perfect! This has to be the most realistic looking Monarch butterfly image that I've ever seen. You have done an outstanding job on this image, this card and this hop! Beautiful! Love the soft background to show off that bold beautiful butterfly! This is so pretty Janice!